The compact KH 750 DSP is the ideal choice for smaller rooms and smaller studio monitors, such as the KH 80 DSP. 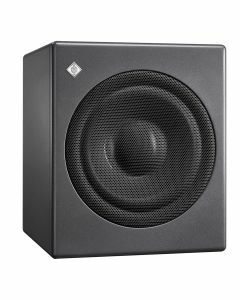 It has a unique and flexible 2.0/0.1 Bass Manager allowing the subwoofer to be used in many different system configurations. On the back panel there are analog and digital inputs and outputs, four routing modes and adaptable acoustical controls to allow for seamless system integration. The Neumann.Control app for iPad offers several features allowing you to setup, align and operate the KH 750 DSP and KH 80 DSP even in large setups up to 9 loudspeakers. Infrasonic filter: frequency; slope: 6.5 Hz; 12 dB/oct.